Inflatable space habitats may sound like the stuff of science fiction to some, but such a contraption actually already exists in the form of a one-room module currently attached to the International Space Station for testing. Built by Las Vegas-based Bigelow, the company now has its eye on taking its blow-up living area far beyond the space station, all the way to the moon. Partnering with United Launch Alliance — a joint venture of Boeing and Lockheed Martin Space Systems — Bigelow said it hopes to send put the B330 expandable space habitat into lunar orbit by 2022. Bigelow’s B330 habitat — a larger version of the BEAM module currently attached to the space station — is composed of a super-strong, multi-layered Kevlar-esque material. One of its big advantages is that it can be packed into a small space for cheaper and more efficient transportation before being inflated to five times its original size once in space. NASA first outlined the idea for BEAM before Bigelow took on its development about 10 years ago. 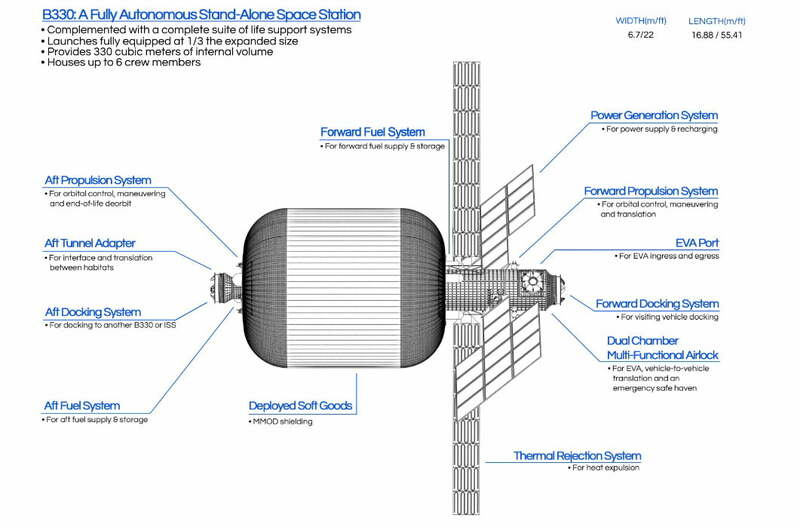 The company says the expandable habitat, which is about a third of the size of the space station — has the potential to be used for pretty much anything, including a microgravity research center, a space farm, a dormitory for deep space missions, a kitchen/cafeteria for astronauts, and even as a “private space yacht” for wealthy vacationers looking for a different kind of trip. If Bigelow can raise the funds for its grand plan, the B330 would begin its journey to the moon on a Vulcan 562 rocket that would first take it to low-Earth orbit. During this phase, the habitat would be expanded, kitted out, and tested for any issues. Once fully operational, the B330 would embark on its journey to low-lunar orbit. Bigelow said his “lunar depot plan is a strong complement to other plans intended to eventually put people on Mars.” Indeed, researchers at the Massachusetts Institute of Technology have suggested that billions of dollars could be saved by using the moon as a pit-stop for eventual missions to the red planet.